Several senior members of the Liberal Democrat group at Lewes District Council have confirmed they will not be standing for re-election in May. Speaking at a meeting of the council’s cabinet on Wednesday (March 27), Liberal Democrat Group leader Cllr Sarah Osborne announced she would not be standing again as a candidate in the May council elections. Two other senior Liberal Democrat councillors – Mark Chartier and Peter Gardiner – also confirmed they will not stand again during the meeting. Cllr Osborne said: “This is my last cabinet meeting, I am not standing again. “I wanted to first of all thank staff. I have been a councillor for 12 years and unfailingly the staff have been brilliant. “I want to thank all the councillors for all parties, because I have genuinely had a great time. “I do feel sad I won’t see a lot of the things I actioned happen here. The housing I got money for [and] the local lottery scheme, which is not going yet. Ward councillor for the Plumpton, Streat, East Chiltington and St John Without, Cllr Osborne is also an East Sussex county councillor for Ouse Valley West and Downs. 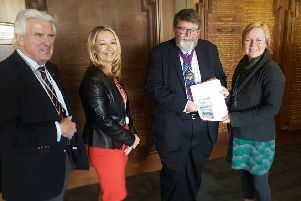 Cllr Gardiner also reaffirmed his decision not to stand for re-election – which he had made public several months ago – and paid tribute to the work of officers and councillors. He also gave special praise to Cllr Osborne, who he said ‘made a huge difference to the council’. Unexpectedly, Cllr Chartier also confirmed he did not plan to stand again as a Liberal Democrat councillor. A long-serving council member, Cllr Chartier had been ward councillor for Lewes Castle since 1987 and is currently chairman of the audit and standards committee. Conservative cabinet members Paul Franklin (Seaford North) and Tony Nicolson (Seaford East) also confirmed they plan not to seek re-election during the meeting. The announcements on Wednesday come after the resignations of two other prominent Liberal Democrat councillors in recent months – Newhaven Valley councillor Steve Saunders and Kingston councillor Vic Ient. Speaking to the LDRS, Cllr Ient says he will not be standing again as a councillor but plans to continue his work with the Campaign to Protect Rural England and the South Coast Alliance for Transport and the Environment (SCATE) locally. Cllr Saunders, however, will be standing again as an independent candidate. This means five out of nine councillors from the Liberal Democrat group have confirmed they will not be standing again.